2. Choose items from the wishlist, adjust quantity, and click Donate. Selected items will be added to your cart. 3. When ready to pay, click on Checkout at the top of the page, enter your credit card information and click on Confirm and Pay. 3. Once your profile is created, you will be able to edit it by adding your profile picture, writing about yourself, and posting links to your profiles on social media sites. 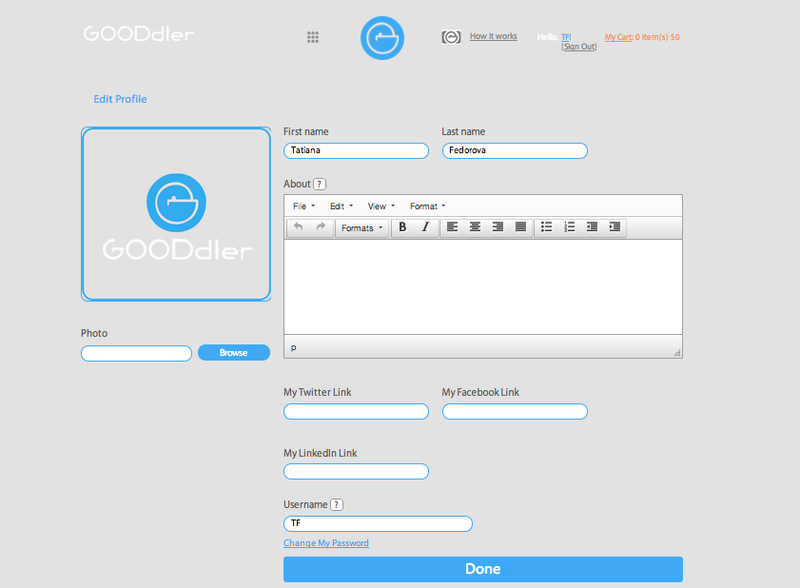 Tell Gooddler community about yourself. It will help you to connect with others who have similar interests. 1. Log in into your account. Click on the App launcher icon and choose My Donees. Tell us about your organization, what makes you unique, what needs you fulfil, whom you serve. Make your description compelling for Gooddler audience. Make sure you entered the address correctly. Check and double check to avoid items shipped to a wrong address. g) Edit Photo Gallery. You can add multiple pictures that tell stories about your organization. Visual images help a donor to make a decision to become a supporter of your organization. Don’t skip this step. Now as you created a page for your organization you are ready to Create a Wishlist. 3. Click on Create a New Wishlist! b) Enter Description. What is the purpose of this Wishlist? What needs will it satisfy? 6. Edit photo gallery. Make pictures stand out. They will add value to the message. To be able to add items to a wishlist, you have to create it first. 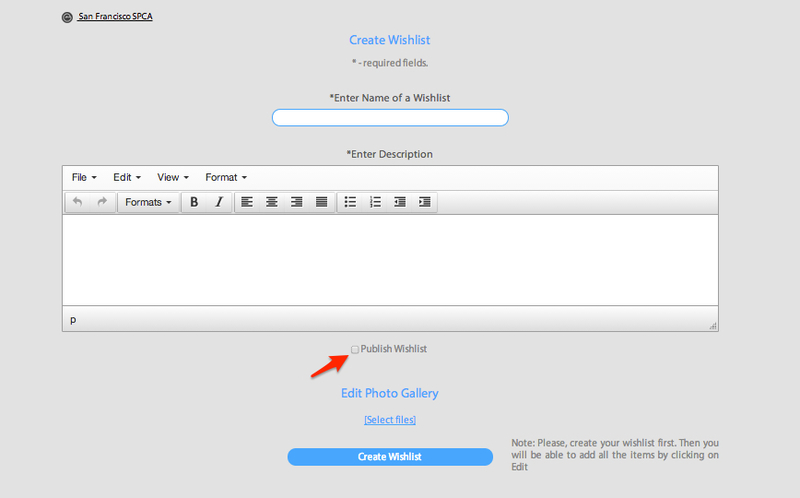 See “How to Create Wishlist” for instructions. 1. After you created a wishlist, click on “Edit this Wishist” to add items to it. 2. Find your desired item on Amazon. Copy the link and enter it into the “Amazon URL” slot right below Add Items, select desired quantity and click Add. Repeat it one item at the time. 3. When all items are entered, click on Update Wishlist. 1. Create Donee Page. See “Create Donee Page” for instructions. 2. Click on the App launcher icon and choose My Donees. 5. 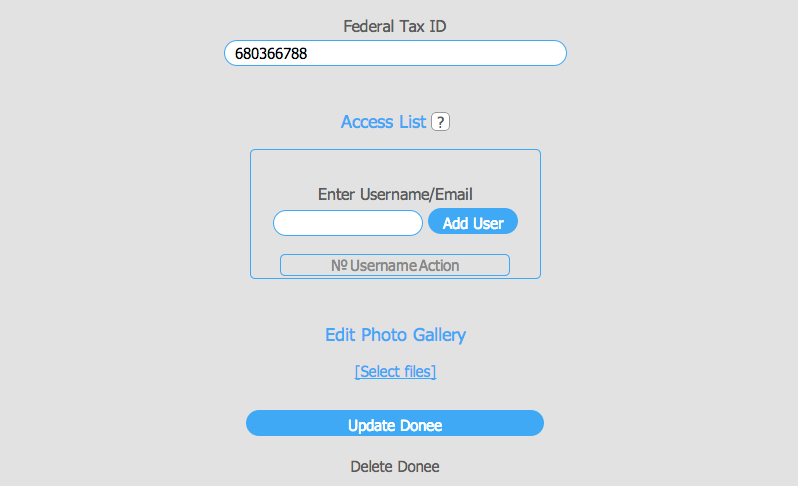 In the empty slot enter an email or a username of a person you would like to add as administrator of this Donee. This person will receive all rights to manage, support and edit a page of this Donee. 6. Click on Add User. The person that you added will receive a notification via email. 2. Select a Donee by clicking on the link. It will take you to Edit Donee page. 3. Make sure to Update Donee, once changes are made. 1. Log in into your account. Click on the App launcher icon and choose My Wishlists. 2. 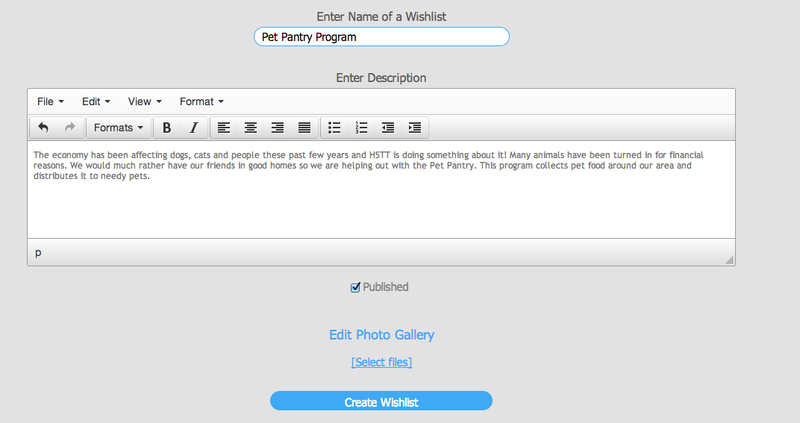 Choose a wishlist you want to edit, click on the link and you will be redirected to the Edit Wishlist page. 3. 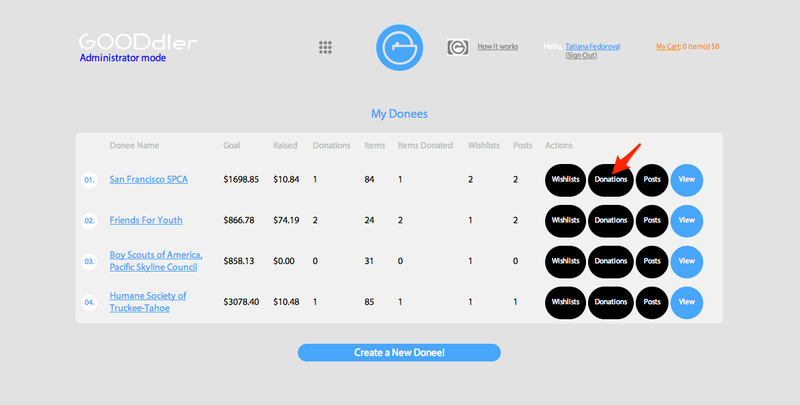 On this page you will be able to add/delete items, edit wishlist’s name and description, add/delete pictures, and delete this wishlist. 3. 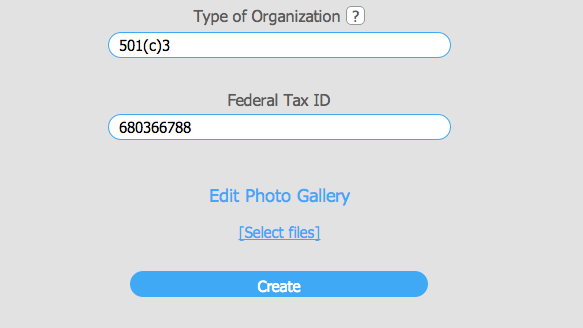 Create Post to Donor, add pictures and click on Create. Don’t worry, you will be able to edit your posts even after they are published. 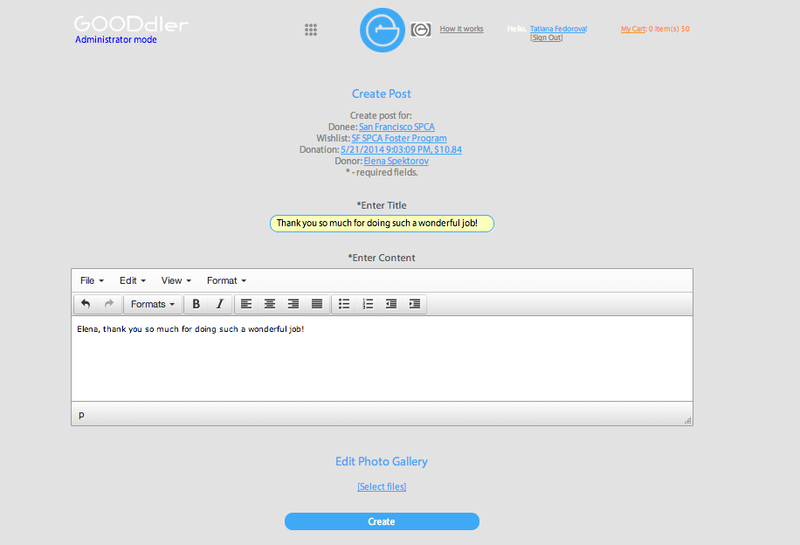 When you are creating a new donee, editing a profile of an existing donee or creating a new post you have an option to upload a picture. At the bottom of Create Donee, Edit Donee or Create Post page click on "Select Files. "Select a desired file from your computer. Pay attention to its size. A file can not be bigger than 1MB.